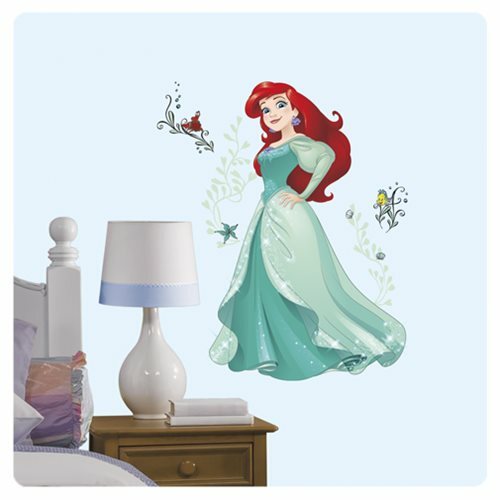 Show off your love for your favorite Disney Princess with these Sparkling Disney Ariel Giant Wall Decals by RoomMates Decor! Featuring bright and colorful Disney Princess art, this beautiful, life-sized image of Ariel dressed in her sparkling teal ball gown will make any room shine. Plus, this decal is made with real glitter giving a real sparkling effect! A fast and affordable way to build a stunning scene on any wall, just peel each removable and repositionable wall sticker from the sheet and place directly on a smooth, flat surface. Measures 36-inches tall x 23-inches wide when complete. Ages 13 and up.